The San Juan River twists and turns through the most convoluted canyon in the Colorado Plateau. Its home in southeastern Utah is a place of surreal beauty and vibrancy, hundreds of millions of years in the making. Eons of wind and water erosion have left an intricate wilderness of sunbaked red rock cliffs, canyons and monuments interwoven with cool, shady alcoves, lush grottoes, and side canyons where diverse vegetation grows near trickling streams. On this special departure, approximately 40% of your trip cost will go to supporting the Save the Colorado 501(c)3 non profit organization. We’ll meet at 7:00 PM at the San Juan Inn in Mexican Hat, Utah, for a pre-trip meeting. This is an opportunity to meet your fellow travelers and guides, and ask any last-minute questions. Your guides will present a thorough trip orientation and pass out your waterproof river bags so you can pack your belongings that evening. We begin our day with a short drive to our put-in at Mexican Hat, where your boats and your OARS crew await. After a thorough safety talk, our journey begins. We peacefully float for a few hours, getting to know our fellow travelers and soaking in the majesty of our surroundings. Our first day generally sets the pace for our river trip. Typically, we spend a few hours on the water in the morning, sometimes stopping for a great hike, a visit to an historic prospectors cabin or a refreshing swim. At lunchtime, we pull over to a sandy beach and enjoy a delicious picnic. After feasting and relaxing on the beach (or perhaps swimming, a game of Frisbee or a nature walk), we get back in our boats and watch the desert panoramas slowly develop and change as we tranquilly float down the river. Mid- to late-afternoon, we stop and make camp; you grab your bags and set up your tent while the guides take care of the kitchen and “living room”— camp chairs and the site for tonight’s campfire (if permitted). This is the perfect time for you to lounge on the beach with that book you’ve wanted to finish. Read, nap, or just sit back and laugh with friends and family as we prepare dinner. Before long you’ll be savoring pleasing hors d’oeuvres and the beverage of your choice—delicious as these refreshments are, they always taste better after a day on the river! After another satisfying feast, the evening is yours to spend however you wish. Maybe music, stories or jokes will bring us together tonight; maybe the popping of the fire, the whisper of the river and the clarity of the big, star-filled sky will encourage silent reflection on the amazing wilderness that is, for now, our home. Your day begins as the morning light turns the cliff walls the colors of sunrise. Fresh coffee and tea are waiting for you when you get up; grab a cup, sit back and take in the glory of the awakening river. Soon breakfast is served—omelets made to order, blueberry pancakes, sizzling bacon, fresh fruit, toast, and juice are among the treats you indulge in each morning. Once you’ve eaten your fill, you pack up your things as the guides break down camp, and then our new day’s adventure begins. As the San Juan carries us further into this majestic geological corridor, we begin to see evidence of the earth’s activity—slow and steady, or sudden and violent—over the course of its 300-plus-million-year existence. After leaving the fascinating Goosenecks, we’re treated to glimpses of rocky wonders like Cedar Mesa, Cowboy Hat, and Eagle Rock. Beneath this stretch of river lie extensive oil fields, and at lower water levels, we may be able to see the very oil seeps where the Ancestral Pueblos may have gathered this precious resource for fuel and medicine. All along, we keep watch for bighorn sheep near the water. Our trip is certainly not devoid of whitewater, and this stretch of river delivers plenty of excitement with rapids such as Ross and Government. A favorite activity on the San Juan is a visit to Slickhorn Gulch for a much-needed swim in its natural plunge pools. This beautiful canyon holds many hidden surprises, including fossils, maidenhair ferns, and waterfalls. Our trip draws to a close on Day 5 as we reach the Clay Hills boat ramp. Feeling as if we’ve temporarily left our modern age for the past three days, and having grown so close to our guides and fellow travelers, the shuttle ride back to Mexican Hat and “civilization” is bittersweet. However, it doesn’t take long to realize that although we’ve left the river, the river will never leave us. The day before your trip we will meet at 7:00 PM at the San Juan Inn for a pre-trip meeting. Your trip leader will provide a thorough trip orientation and pass out your waterproof bags so you can pack your belongings that evening. The trip leader will also reconfirm the meeting time for the following morning and give you an opportunity to ask any last-minute questions. Mexican Hat, Utah is located in southeastern Utah. From Moab, take Highway 191 south. You will go through Monticello, Blanding and Bluff. When you get into Blanding you will come to a four-way stoplight. You will need to make a left turn and continue on Highway 191 south. You will eventually descend into Cow Canyon when you near Bluff. You will continue on Highway 191, which is also called Main Street in Bluff. 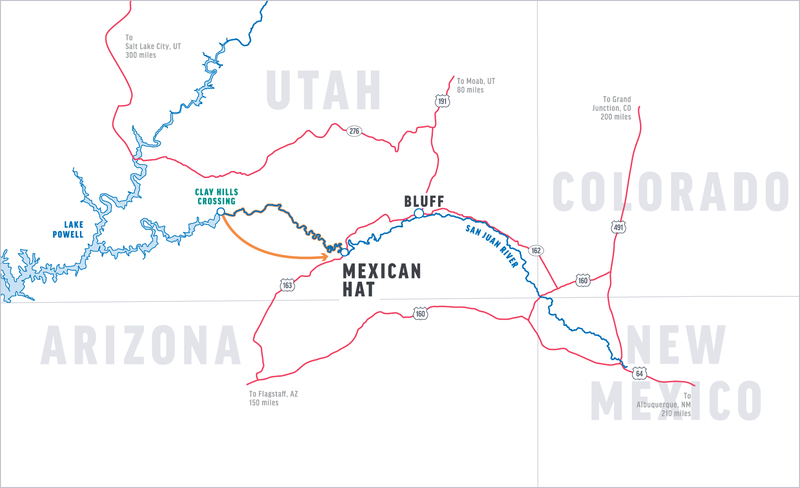 Highway 191 will turn into Highway 163, which takes you straight to Mexican Hat. From Salt Lake City, take I-15 south to the Price/US 6 exit. Then take US 6 to I-70 east, to US 191 South. You will continue on Highway 191, which is also called Main Street in Bluff. Highway 191 will turn into Highway 163, which takes you straight to Mexican Hat. San Juan Inn will be on the right side of the road, before you cross over the river. If you’re coming from Grand Junction, Colorado take I-70 West to US 191 or take scenic route 128, which follows the Colorado River and offers spectacular views, to Moab and US 191 (adds a half hour). Follow 191 South until it turns into 163. Stay on 163 until you reach the San Juan Inn, in Mexican Hat. Or from Cortez, Colorado, take US 160 west to CO-41 to UT-163 into Mexican Hat. If you’re arriving by car, parking is available at the San Juan Inn. You may fly into Salt Lake City, Utah, Moab, Utah, Grand Junction, CO or Cortez, Colorado, which are serviced by several commercial airlines. On the final day of your river adventure, you will be returned to the San Juan Inn. You should arrive between 4:00-5:30 PM. We recommend that you make reservations well in advance in order to guarantee lodging as San Juan Inn has limited lodging options. We recommend the facilities listed below. (Pre- and post-trip lodging is not included in the trip cost). Please note: During the high-water season use of inflatable kayaks will be at the guides’ discretion. You may want to check one week prior to your trip for an up-to-date weather forecast. We recommend the following website: www.wunderground.com for weather in Mexican Hat, Utah. A good way to keep cool is with long-sleeved cotton shirts. They can be soaked in the water and worn in the raft or carried on a hike for later use. This method of evaporative cooling is very effective. Bandanas are another useful item that can be used in this manner. During summer months, conditions on the river may be hot and sunny. These trips require less gear than spring or fall trips, but thoughtful packing is still required. Protection from the sun and heat will be critical to your enjoyment and health while on the river and during side hikes. To protect yourself from the sun’s rays, consider bringing long-sleeved shirts and pants. Lightweight, nylon ‘safari’ shirts are readily available and often come with a UPF rating for reflecting harmful ultraviolet rays. These pack small, light, are quick drying and often offer ventilation to help keep cool. At the pre-trip meeting each person will be given two large waterproof bags (approximate sealed size: 13” diameter x 25” tall; 3318 cu in; 54.4 L). One bag will be for your clothing and personal items; the other bag will be for your sleeping gear (sleeping bag, sleeping pad, ground tarp, sheet and pillow). These two bags will be your “checked luggage” and will only be accessible in camp. Tents are stowed separately. Please note: if you rent our sleep kit, it will come already packed in one of the 2 waterproof bags issued to each passenger. We also provide a small waterproof bag for day use where you can keep items such as raingear, camera, sunscreen, lip balm, etc. (approximate sealed size: 17” tall x 9” diameter; 1081 cu in; 17.7 L). The bags are cylindrical in shape and pack from the top. Please pack light, and keep in mind that river attire is casual: comfort, convenience and boat space take precedence over style. At the end of the trip, you will return to Mexican Hat with your waterproof bags, where you will be able to unpack your gear before your trip home.